John James Audubon (1785-1851) is one of the best-known ornithologists of the eighteenth and nineteenth centuries. Born in present-day Haiti as the illegitimate son of a French merchant and Creole woman, Audubon moved to France with his father when he was five years old. It was there that he first developed a particular interest in birds and drawing. When he was eighteen, Audubon moved to his father’s estate in Pennsylvania to avoid being drafted into Napoleon’s army. As an adult, Audubon tried several business ventures with different partners but failed at all of them. Eventually, he began to devote the majority of his time to the study and drawing of birds. 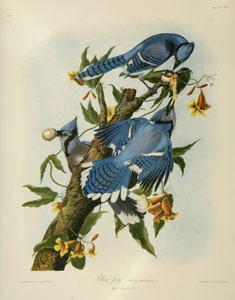 Over the course of several years, Audubon drew many pictures of birds throughout America. These drawings were published between 1827 and 1838 in the four volume collection, The Birds of America. During this period, Audubon split his time between Europe, where his publisher and patrons for the collection were located, and America, where he continued his study of birds. In 1839 Audubon moved to New York City, where he created a smaller-sized edition of The Birds of America and a three volume work entitled Viviparous Quadrapeds of North America. Audubon died in New York City in 1851. 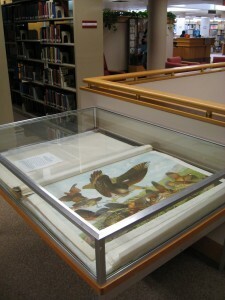 Van Wylen Library has one of the volumes of The Birds of America. Formerly located on the north end of the first floor, the display was recently moved to the south side of the staircase on the second floor to prevent overexposure to sunlight. UV filters have been installed on the florescent lights near the volume to protect the book. Because the book is under a glass case, it is not possible to browse through the plates yourself. However, if you would like to see the images, the University of Pittsburgh has a website with the plates and accompanying text from Ornithological Biography. 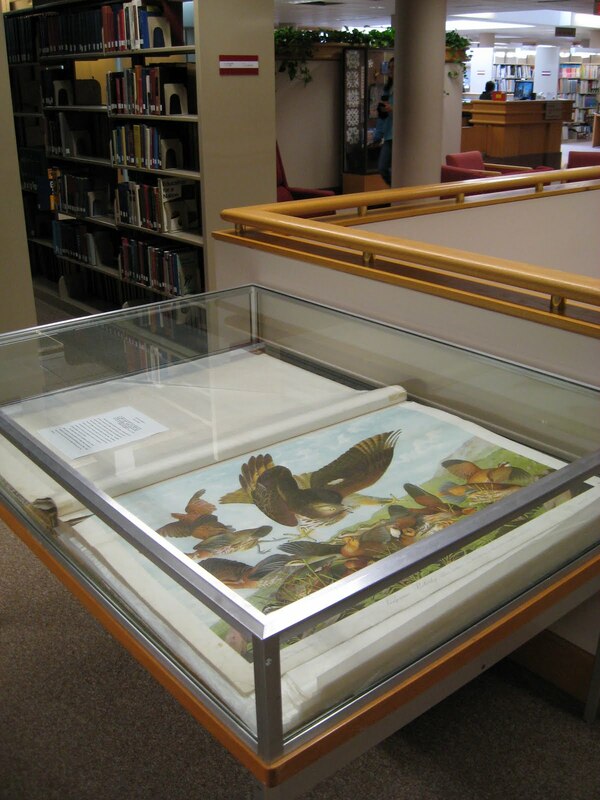 If you would like to learn more about Audubon and The Birds of America, we have several books in our collection on this topic.